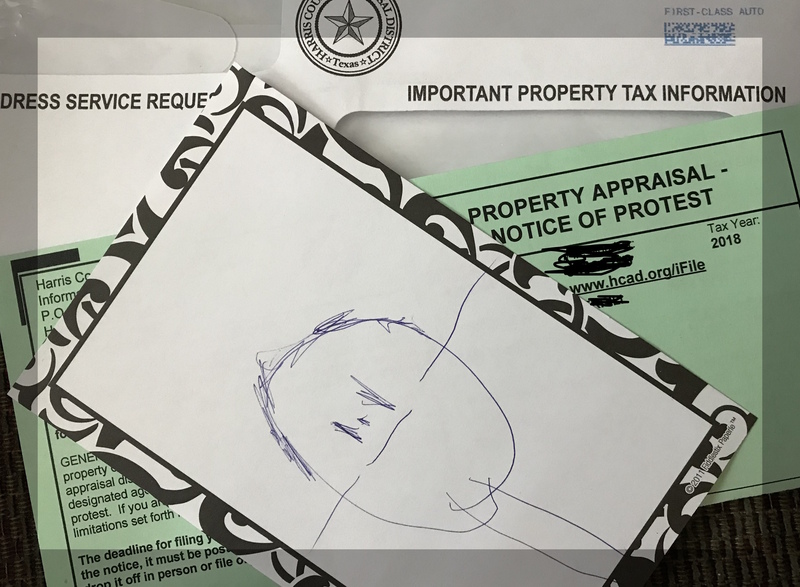 Have you received your Property Tax Information and Notice of Protest in the mail? Perhaps your's did not include the picture my granddaughter drew which I felt accurately summarizes how we all feel about it. While it is an inconvenience, I encourage everyone to at least attempt to protest your taxes. The first step can often be done online or by completing the form they send to you. The deadline is May 15th to file your protest. Do the opposite of when you want to sell your home. Look at all those projects you haven't done, deferred maintenance, things that need repair and "highlight" them. Take a photo of the carpet in your bathroom, the crack in your ceiling, the original 1990 cooktop and share them with the appraisal district why your home is not worth what they say. If asked to appear in person in the tiny, tiny fine print you will see you can mail your items as long as it is received before the hearing. Yes you will need to search out the form that needs to be completed and have it notarized and I'd recommend sending it FedEx or someway that is trackable. But this will help you avoid sitting in traffic on the northside of Houston if you live in Harris County. If you live in Brazoria or Galveston county - count your blessings and try to appear in person if you can. Ask your favorite Realtor (ahem me!) to run you comps for last year for your area and see if that can help your case. DID YOU FLOOD DURING HARVEY? In an article in Sunday's Houston Chronicle it stated that some appraisal districts are not attempting to identify properties that flooded during Harvey and are relying on homeowners to "self report". All the more reason to get the word out! While my track record would show I am not an expert on protesting property taxes, I hope these hints will motivate you. Doesn't hurt to try!